When was the last time someone begged you to share the gospel of Christ? In today’s reading, those who hear the story of Jesus, implore Paul and Barnabas to return the next Sabbath so that they may hear the story again. They have heard the story once, but once is not enough. They want to hear it again and again and again — to drink continually of the living water of God’s Word and to feel his forgiveness and love wash over them anew every week. Perhaps you have noticed that the cultural landscape in which we live has become parched and dry. Secularism is invading the Church and threatens to drain the life from the body of Christ. People everywhere are searching for anything to quench their spiritual thirst as morality continues to withers and die. But our hope is in the Lord and his Holy Word. As Christians, we know where to find the water that all humanity craves. We enjoy this refreshing gift of the gospel every time we gather in worship, and we are sent forth to take this gift into all the world. 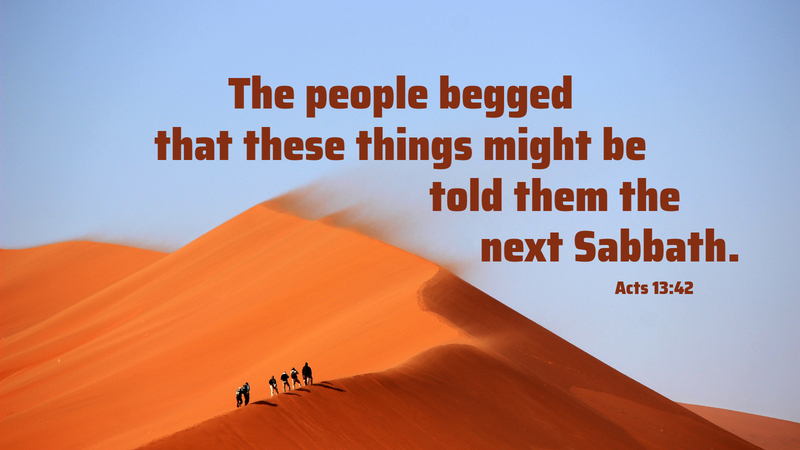 People are thirsty — begging for the gospel of Christ. So, go and share. Prayer: Living Water, give us courage to carry the gospel of Christ wherever we go. Amen. I recently read that Kathy Lee Gifford would not tell her children or grandchildren that she was proud of them, she wants them always to be humble. Humility leads us back to the cross, back to Jesus. Scripture shows that each time Israel became haughty, God turned away from them. Today, the church, Christ’s body is not showing humility, not bowing down in prayer. Maybe that’s why churches and pastor’s in particular are failing?